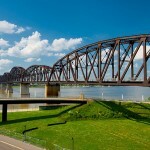 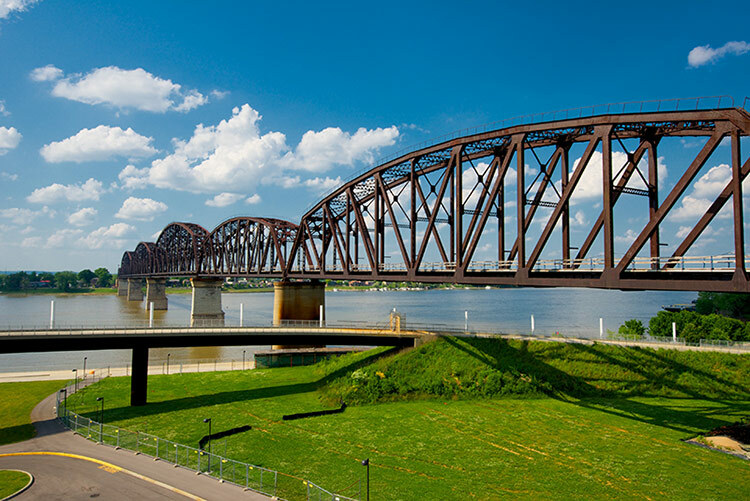 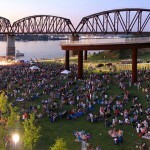 A one-mile-long pedestrian bridge spanning the Ohio River between Louisville, Kentucky and Jeffersonville, Indiana is under construction and expected to open next spring. 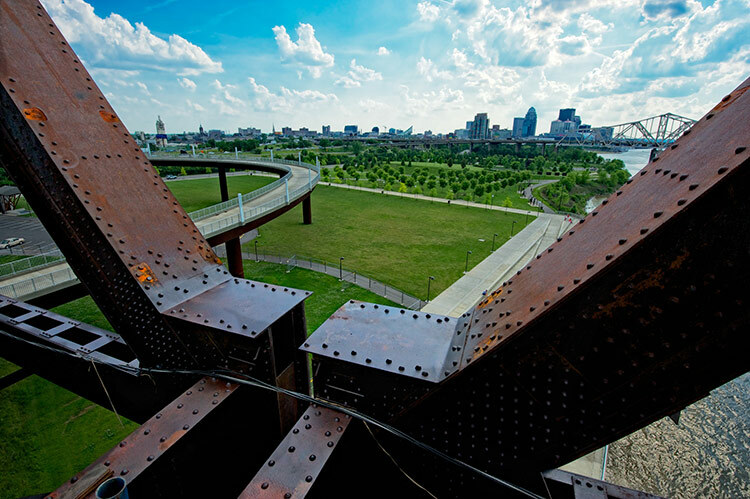 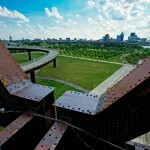 With work progressing on laying a new concrete deck on the circa 1895 former railroad bridge and a dramatic elliptical spiral ramp built of Cor-ten steel to match the patina of the old span already soaring above the Hargreaves-designed Waterfront Park in Louisville. 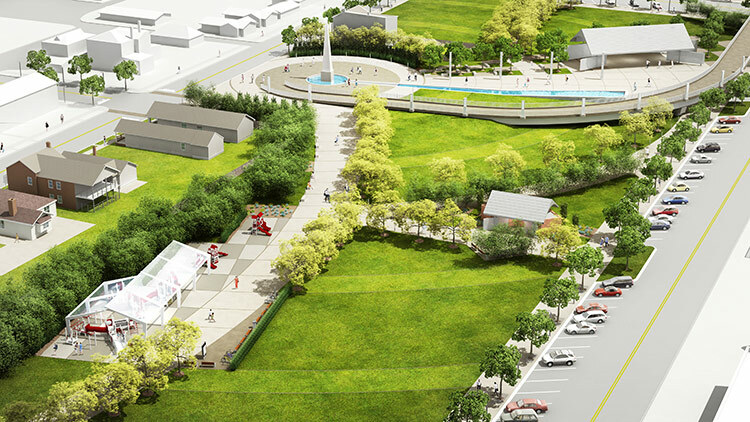 The latest piece of the puzzle came into focus in late July as a new park in downtown Jeffersonville was unveiled to the public. 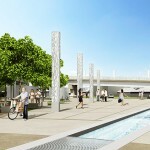 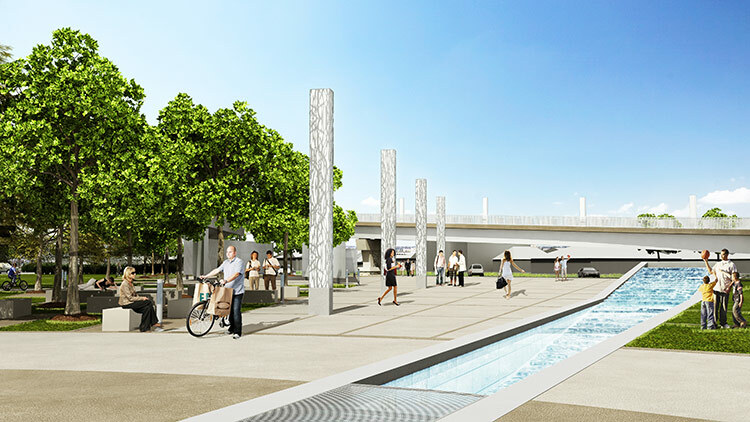 At the northern end of the bridge, a new ramp follows the original path of the Big Four approach before taking a turn to drop pedestrians and cyclists at ground level one block from the central business district. 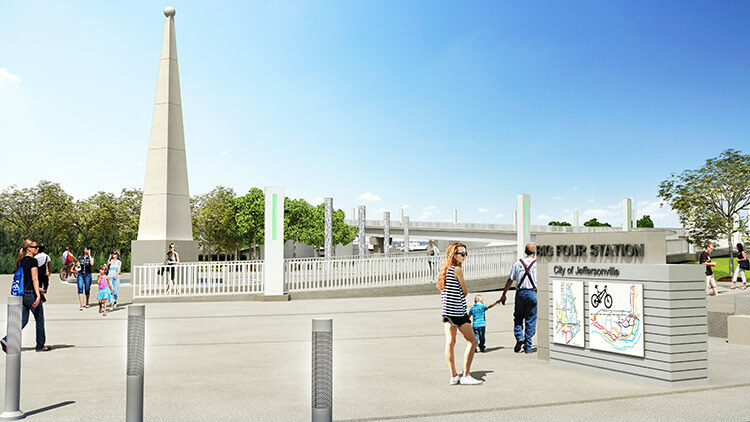 Here, Big Four Station, as the park is called, forms a monumental gateway into the city complete with an obelisk at the base of the ramp, four sculptural light columns surrounding a water feature, and an open air pavilion. 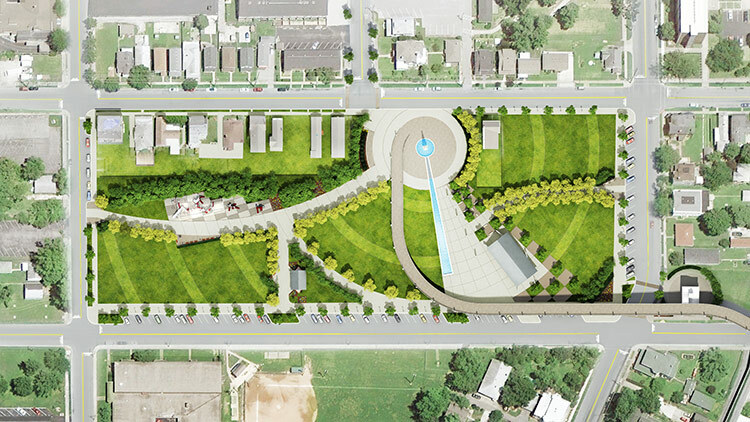 The park sits on the site where a grand canal was once planned to spur economic development and ameliorate combined sewer overflow issues under an EPA consent decree. 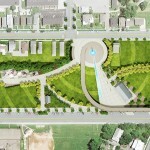 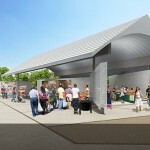 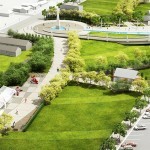 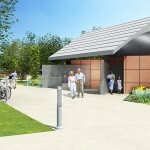 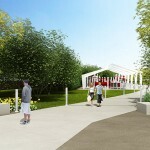 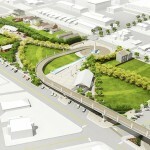 Designed by The Estopinal Group (TEG) and Taylor Siefker Williams Design Group, the park’s layout—currently in the concept phase pending public approval—radiates from the obelisk, forming a series of smaller spaces designed to handle farmers markets, public events, and general play. 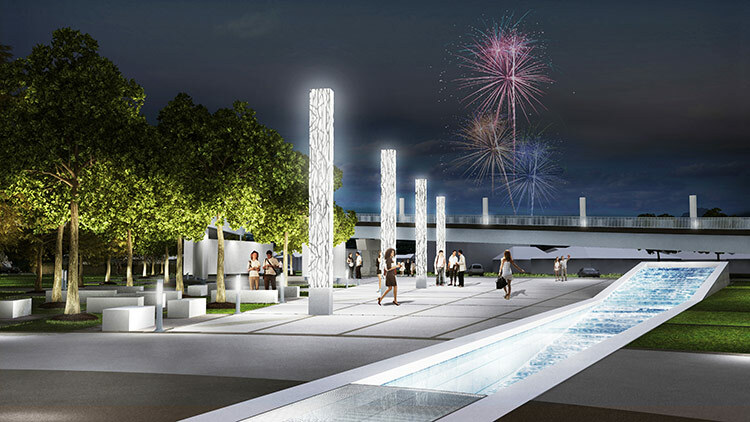 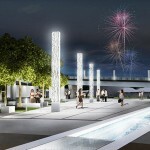 A cascading water feature forming an exclamation point in plan frames a market pavilion and four 25-foot-tall, internally-lit light towers covered in a layered metal filigree and art glass. 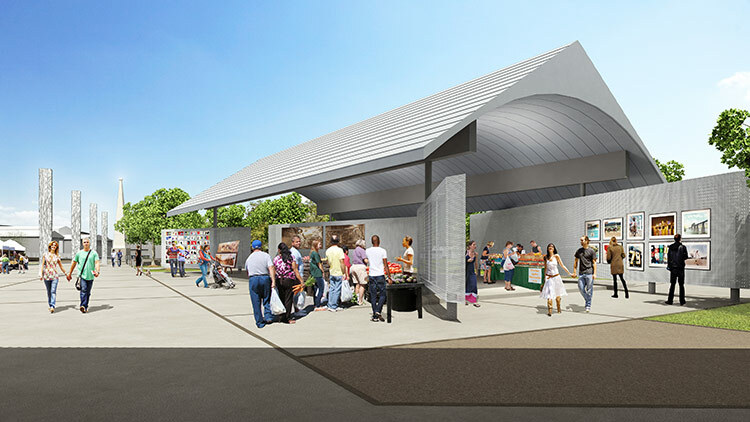 Anchoring the plaza, a large open-air pavilion blends traditional and modern design to create a multipurpose space with a pitched roof and an internal barrel vault. 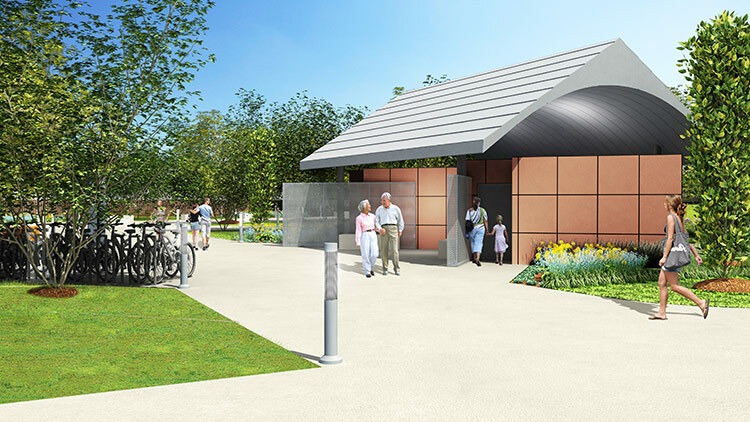 A series of perforated metal walls obscure the pavilion’s structural supports, provide an easy way to hang objects during events, and offer additional security since visitors can see if someone is on the other side. 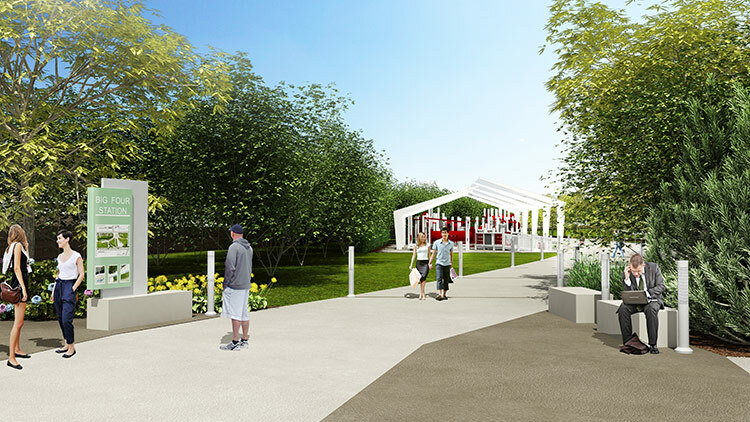 At the other end of the park, a playground covered in a tensile-fabric structure keeps children cool in hot months and a bike rental station provides easy access to the bridge. 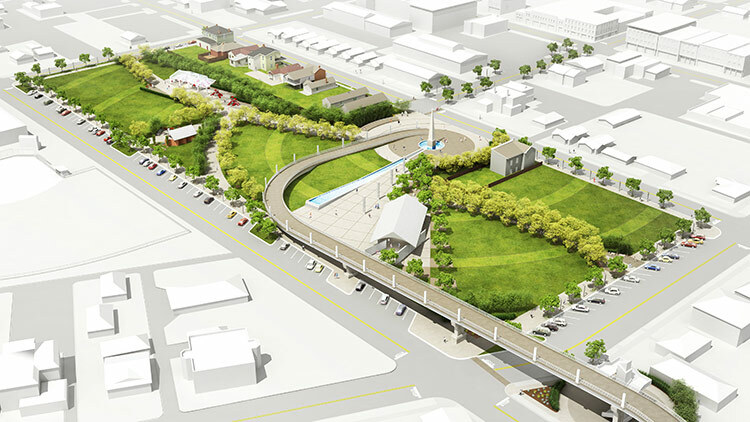 Two parcels adjacent to the landing have also been reserved for future development around the bridge.